European Cup Winner’s Cup action and desperate relegation threatened encounters with Tottenham in the week 27 February – 5 March in Hammer’s history. The European Cup Winners Cup is at the forefront of the action in this week’s Hammer’s History. Having won the competition at the first attempt in 1965 the Hammers were in the following year’s competition as holders. In the 3rd round (Quarter Final) stage in 1966 the opponents were FC Magdeburg from East Germany, a country not recognised by the UK at the time. In a closely fought game in the first leg at Upton Park Magdeburg came close to causing an upset but the tie was settled in the first minute of the second half when Geoff Hurst nodded down a Martin Peters cross for Johnny Byrne to score from close range. Ten years later at the same stage of the competition it was Dutch opponents in the form of FC Den Haag (now ADO Den Haag). The first leg was away in The Hague and with manager John Lyall incapacitated through illness there was a brief return to the manager’s chair for Ron Greenwood. The Hammers found themselves 4-0 by half time which included two very soft penalty decisions and another that was scored from a breakaway amid confusion after the (East German) referee awarded a drop ball. Tactical changes at half-time altered the shape of the game and two goals by Billy Jennings put some respectability on the scoreline and gave the Hammers hope for the return leg. 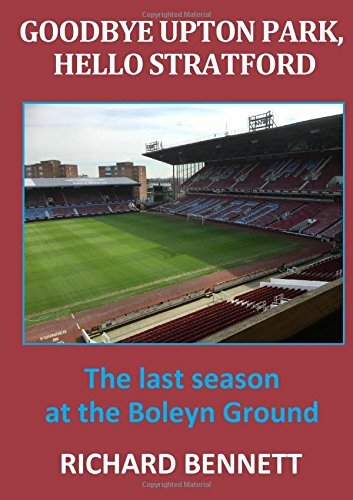 It is not often that you will find supporters including a 4-1 home defeat among the list of their favourite games yet the first leg 3rd round ECWC defeat by Dynamo Tiblisi is often cited among the most memorable games at Upton Park. In 1981 West Ham were flying high as runaway leaders in Division 2 as well as having already booked a League Cup final appointment against Liverpool. Dynamo Tiblisi from Georgia were, at the time, representing the Soviet Union and their performance at Upton Park was a masterclass, with spectacular performances particularly from Chivadze, Kipiani and Shengelia. The Hammers were 2-0 down at half time and although they momentarily offered a glimmer of hope when David Cross pulled one back early in the second half, the Georgians restored their two goal advantage a minute later and added another to make it 4-1 with twenty minutes to play. To their credit West Ham won the second leg in Georgia by the only goal, just a few days after the League Cup final, but it was not enough to prevent Tiblisi going on to win the tournament. In domestic competition there was a 6th round tie in the 1963/64 FA Cup as West Ham saw off the challenge of Burnley to set up a semi-final clash with Manchester United. A more detailed review of this game will appear shortly in Richard Bennett’s series of Favourite Games. In the same week West Ham also faced Burnley in the league, losing 3-1 at Turf Moor. In League action two home games against local rivals Tottenham stand out in relegation threatened seasons where the outcomes of the games and the seasons brought very different emotions. In 2003, transfer-window signing Les Ferdinand scored his first goal for West Ham against his former club to put the Hammers en route to a well deserved 2-0 victory, the second goal converted by Michael Carrick. The victory left West Ham level on points with Bolton Wanderers in the fight to avoid the third relegation spot which was ultimately beyond them. A thrilling encounter between the two teams in 2007 produced a first West Ham goal for Carlos Tevez as the Hammers took a 2-0 lead, were pegged back to 2-2, went ahead again with just 5 minutes remaining only to concede two late goals to lose the game 4-3. Defeat left West Ham bottom of the table and seven points behind fourth from bottom Wigan Athletic. Despite the set-back the performance signalled the start of the great escape that would then trigger the Tevezgate saga. West Ham recover from a reckless early penalty award but then fail to take advantage of second half dominance. “How do you fancy going to the cinema on Saturday evening?” my wife asked me earlier in the week. We are regular cinemagoers and she wanted to see one of the films that were in contention for best film at the Oscars on Sunday, Fences. Last week we went to see another of the contenders, Lion, which was an excellent film, and thoroughly enjoyable. She forgot to tell me until Saturday morning that the 8.45 showing was full booked, so she had booked for the earlier 6.00 one. I hadn’t mentioned to her that West Ham were live on TV with a 5.30 kick off. In the past this would have been a problem but with Sky Plus I was not too concerned. All I had to do was to set the game to record, and then watch it “as live” when we got home at 9pm. This was just a modern day version of the famous Likely Lads episode of fifty or so years ago, where Bob and Terry had to go to great lengths to avoid finding out the score of an international match where they wanted to watch the highlights later in the evening. All I had to do to avoid knowing the outcome was to switch off my mobile phone (a requirement in the cinema anyway), and ensure that the car radio was switched off when we got back into the car after the film. Living in Bury St Edmunds there was little likelihood of hearing anybody talking about the West Ham game. All went to plan, and as I was watching the preamble to the game, I forgot and switched on my mobile phone, and there was a text from a friend timed at 5.40 which said “What the hell did Kouyate do that for?” I quickly switched off the phone, but could tell that it probably wasn’t good news close to the start of the game. I wondered what he had done. Scored an own goal? Missed an open goal? Still, I had avoided knowing the outcome of the game. As the game started, and only a couple of minutes had elapsed, I watched in horror as Kouyate fouled our old friend Zarate for absolutely no reason with the clumsiest of challenges, and I had to agree with the text. What the hell did Kouyate do that for? Deeney’s penalty was well taken and we were one down almost before we had started. My wife made the comment that perhaps it was a good thing we hadn’t stayed in to watch the game live! The first half was pretty boring and more than once I was tempted by the fast forward button because I couldn’t really see us scoring. At least the second half started brightly, but it looked like one of those games where we weren’t going to score. I wondered how much benefit we had got from the warm weather training in Dubai? Then Antonio’s pace took him clear and he managed the almost impossible, to hit both posts with one shot, but no fear, Ayew was there to tuck in the rebound. I thought that we’d go looking for the winner then, but our equaliser seemed to rejuvenate Watford who had looked poor in the second half, sitting back defending their one goal lead. And of course they should have scored with the last kick of the game, where Noble played their attack onside, but fortunately they didn’t convert a relatively simple chance. The irony was that, at the end of the weekend’s games we had actually climbed into ninth place, thanks to Stoke’s capitulation at the hands of our North London neighbours. One things that struck me when reflecting on the game was how far both teams, who are comfortably in mid-table are lagging behind the top six teams in the league. We are long way short in terms of quality of personnel and tactical ideas to get anywhere close. On Sunday afternoon I watched the EFL Cup Final with two teams I don’t particularly care for serving up an entertaining game for the neutrals. I was neutral until the horrific linesman decision to raise his flag, quite erroneously, to wipe off a perfectly legitimate Southampton goal. From that point I wanted the South Coast team to win and, despite outplaying United for most of the game, they lost to that late Ibrahimovic goal. The game might have turned out quite differently if the early Gabbiadini goal had stood, as it should have done. I then thought back to the night before when watching Match of The Day, in particular Chelsea v Swansea. The game was locked at 1-1 when Swansea had a perfectly good shout for a penalty when Azpilicueta clearly handled the ball, but referee Swarbrick waved play on. Inexplicable, I thought to myself as Chelsea went up the other end and scored to take a 2-1 lead. How the game might have turned out differently if the right decision had been made. Once again, there were two examples of the “big team” getting away with a dodgy decision which had a big influence on the game. It is hard enough to beat the top teams anyway, without incompetent officials making it even harder. Video replays must be introduced as soon as possible, because with the fast pace of the modern game, and in some cases sheer incompetence, the officials just cannot seem to get important decisions right. And it is amazing how often the big teams are the beneficiaries. A stressed out manager shows his passion and makes some odd selections as West Ham drop 2 points at Vicarage Road. I wonder how many neutrals made it to the end of this televised game? It has always seemed an odd to time to show live football to me and whoever thought this game might turn out to be a spectacle has to be a seriously optimistic individual. I think even a re-run of Noel’s House Party would have been more entertaining. It is still February and here were two clubs with almost nothing to play for, and it showed. As much as they talked up the ‘looking over their shoulder’ on the commentary it end of season fare being played out well before the clocks have changed. Probably the early goal had an impact on the structure of the game but it was disappointing that the spot-kick was the only noteworthy action of a limp first 45 minutes. The second half was better, but only in comparison with the first, as West Ham upped the tempo in search of an equaliser (with Watford happy to defend their lead) but once the Hammers had secured the deserved equaliser they gave the impression of job done. In fact after the goal Watford showed a little adventure of their own and might have snatched a winner with the very last kick of the game. The one person who did seem to get worked up by events was manager Slaven Bilic whose remonstrations in the technical area resulted in several terse conversations with the fourth official. If you had pressed me to describe Slaven’s normal match-day demeanour I would conjure up an image of a slightly stooped figure, hands resting on thighs and looking mostly impassive except where celebrating a goal. Recently he has morphed into a character very much wearing his passion on his sleeve. Perhaps he has been taking animation lessons from Conte or Klopp. Or maybe there is truth in the rumour that only a top eight finish qualifies for automatic contract renewal and that anything less requires entering the play-offs with Roberto Mancini. It could, of course, be that Bilic has guaranteed improved results after the warm weather break in Dubai or else he has to pick up the tab. I certainly didn’t spot the promised renewed vigour from watching yesterday’s performance but I may be expecting too much. The subject of Slaven’s ire was mainly the refereeing decisions of Craig Pawson. I noticed some online concern with the announcement of Pawson as referee but I can’t say he has ever come onto my radar as particularly bad or with any previous as far as West Ham are concerned. By modern standards and interpretations it is difficult to argue against the penalty award where the mystifying criteria of ‘he’s entitled to go down there’ is known only to former players. Without a doubt players actively play for penalties and Zarate had only that in his mind when going down in the area from Kouyate clumsy attempt to track his run. Interestingly there was a very similar incident at the other end but with Antonio staying on his feet in an attempt to score no infringement was signalled. No wonder that players dive and I got the impression that all it would take was a stiff breeze for the Watford to go to ground, as befits a team with an Italian coach. Apart from the odd disputed corner or throw-in I can recall very few really contentious moments to consider. They say that doing the same thing over and over again and expecting different results is a sign of insanity. Naturally there are many variables in football but it is easy to wonder whether our management and coaching staff ever learn from past experiences. Once again there are so many questions about the selection decisions yesterday. Why stick with Kouyate as emergency right back when Byram was fit? Why put Lanzini out wide when the positive impact of moving him to a central role was so evident in the previous match? How did we get in a position where one of our most dangerous players (Antonio) is rarely played in his most effective position (wide right) and now plays as a lone striker after it was discovered that he wasn’t a right back? What is the point of bringing Fernandes on in the 89th minute every week; is that meant to be developing young players? What is the point of Jonathan Calleri? To the outsider it appears that team selection is based on trying to keep a select group of players happy by giving them a game somewhere rather than taking the difficult decisions. It is still uncertain what style of play or consistent approach we are trying to create as a club and the team remains more a collection of individuals rather than a cohesive unit. Good enough to bob along in mid-table most probably but no better. With Antonio’s red card making him unavailable for the next game at home to Chelsea it is even more crucial that Andy Carroll is fit if we have any hope of giving the league leaders a decent game – or did Antonio get himself banned on purpose to make sure his next employers maintain their runaway lead at the top? It was good to see Ayew get on the score-sheet (and no assist for this awarded to Antonio I believe) but do not see him as being able to offer much in the lone striker role. If the alternative is Calleri then we may as well not bother. It is bewildering that a club (and the 18th richest in world football at that) playing in the most elite league on the planet are so poorly prepared and equipped. West Ham seek revenge at Vicarge Road for the 2-4 London Stadium home defeat back in September. This weekend we visit Watford, who sit 13th in the Premier League and are one of the five clubs separated by just two points in the middle of the table. Stoke are 9th on 32 points, followed by ourselves with the same points but an inferior goal difference, and then three teams on 30, Southampton, Burnley and Watford. As the games begin to run out, and with a gap of five points to West Brom in 8th, then you have to believe that the five clubs are fighting it out to finish 9th. It would take a very good run put together, plus some faltering by the Baggies, to envisage any of them realistically challenging for eighth place. Not impossible, but unlikely I reckon. This is the return fixture of our fourth game of the season, and second at home, where we raced into a two goal lead, which included an outrageous piece of skill from an ex-favourite Frenchman, only to be pegged back by half-time, and comprehensively beaten 4-2 by the finish, mainly as a result of some diabolical defending. From the point that we went two up our defence faced a situation fraught with difficulties in containing the rampant Watford attack; a real hornets’ nest! The Watford captain, Deeney, said in a post-match interview that he felt that the West Ham players were showboating, and this spurred on them on in their comeback. In truth we could have lost by an even greater margin. Watford are one of the many Premier League clubs under foreign ownership, with the owner and chairman both Italian, leading to (unsurprisingly) an Italian manager, Walter Mazzarri. Mazzarri was a journeyman Italian footballer, playing for eleven clubs in a fifteen year period in the 1980s and 90s, and then in his managerial career managed seven Italian teams from 2001 to 2014, including some notable clubs such as Sampdoria, Inter and Napoli. His appointment at Watford last summer was his first foray in football outside his native country, and he appears to have done an OK job leading them to a mid-table position, with no real danger of relegation (unless they collapse dramatically), and like ourselves, not much chance of progressing beyond finishing in ninth place. Watford’s home form is nothing special. Apart from losing at home to Gillingham in the EFL Cup, they have won five of their twelve games, beating (most notably) Manchester United and Everton, as well as more predictable victories over Hull, Leicester and Burnley. They have had three home draws, all against teams below them in the table, namely, Bournemouth, Palace and Middlesbrough. Their four defeats at home have all come against teams above them in the table, Chelsea, Arsenal, Stoke and Tottenham. I wonder if we can make it five? In addition to their win at the London Stadium, they have won two further games away from Vicarage Road, at Middlesbrough, and a surprising win at the Emirates. Their main danger men from a scoring perspective are Deeney, who is their leading scorer with seven, and Capoue who has netted five times in the league. Their goals scored and conceded records are very similar to our own, so in many ways the form points to a potential score draw. The game is yet another of our mid-table six pointers in the “race” to finish ninth, and one that we should be looking to win if we are to continue to hope for a top half finish. Our head to head record against Watford has generally been a very positive one. In the 21 years from November 1985 until August 2006 we faced them 22 times, winning 18 and drawing 4. They didn’t beat us in a period of over 20 years. But in the 8 meetings since January 2007, we have won just two games, with one draw, and Watford coming out on top 5 times. So the recent record has not been a good one. Despite Carroll’s continuing injury, I fully expect us to come out on top this time. I am hoping for some of the incisive movement that we displayed against West Brom two weeks ago, without the defensive lapses that cost us in that game. Perhaps we can reverse the score from the home fixture and win 4-2 this time? What are the chances? The curse of Fergie time scuppered us last time out as we look for a decent return at Watford. Our balance has therefore reduced to 115 points. The odds are quoted by Paddy Power, who have a guarantee that if the team you have bet on in the win-draw-win market (i.e. our first bet above) lead at any stage by two goals then they will pay out, even if the team go on to draw or lose. They started this promotion in November. It was a shame that it wasn’t up and running in the home game v Watford, as we would have been 33 points better off; they would have paid out instantly when we went two goals up. Never mind that’s the way it goes. It’s all good fun and our luck will change (perhaps). Our balance after our 15 points stake this week has now gone down to 100 points, exactly where we started! We’ve come very close to some big wins. The potential returns on winning bets are shown in brackets. What are the chances? I had a look to see if sunbets was offering odds on Adrian being caught on camera eating paella or tapas, but couldn’t see anything! Seriously though, I think that it is a shame that this new bookmaker decided to increase its profile using the Sutton reserve goalkeeper in the week. For me it devalued and took the emphasis away from Sutton’s achievements in the FA Cup this season and their excellent performance against Arsenal. I know that a lot of people thought it was a bit of fun, and it is a pity that the Sutton keeper should lose his job as a result of his naivety, but we do have to be careful to ensure that fixing doesn’t become a feature of football gambling. At one time you could bet on the team who had the first throw-in in a game, and teams were suspiciously putting the ball into touch straight from the kick-off. That practice and those bets are no longer (quite rightly) available, but the pie (or pasty) eating is only one step away from that. Matchday: Hammers to stir up the Hornets? Will it be a case renewed energy and vigour from the Dubai training camp or post holiday blues as West Ham take on Watford at Vicarage Road? If reports are to be believed we are promised a team packed with renewed energy and vigour as a consequence of the warm weather training break in Dubai since our last competitive match. Most of the pictures that I saw from Dubai involved the players eating and dancing but we are assured that they also worked had and with great intensity to work particularly on defensive frailties. Today we will be able to judge for ourselves the effectiveness of this expensive bonding and possibly be wowed by how well those batteries have been recharged. One can only hope that the late kick off doesn’t further interfere with adjustment from the Dubai time-zone – wouldn’t want Mark Noble’s tackles being any later than usual. It was a very good trip, we trained very hard, more than if we had stayed here. We were all together and we all trained once a day. We used it to do a bit of fitness, intensive small games, some work on defence, it was all good. The team bonding is good for the players who didn’t open themselves totally, who come to training and just talk to your best friend and then go home. Today’s opponents have one of the most cosmopolitan squads in the Premier League and, until the recent loan acquisition of Tom Cleverley, captain Troy Deeney was frequently their only English born player. They have also fielded the oldest average age starting eleven of all Premier League clubs during the course of the season. So a super-charged and (relatively) youthful Hammers might be fully expected to zip past these elderly Hornets and make amends for the calamitous defeat at the London Stadium in September. A lot of the reporting after Watford’s win at the London Stadium was focused on Troy Deeney and his reaction to the apparent ‘showboating’ by our players after they had taken a two goal lead. In media terms Deeney had ‘slammed’ the Hammers but in reality he had used the situation to motivate his teammates, and with great success you have to say. It is what I remember as “come on lads they’re taking the piss now” over the park on many a Sunday morning. Whether our manager can now use the perceived slight by Deeney to motivate his own players, who remember are already straining at the leash, even further has the potential to provoke the footballing equivalent of shock and awe. West Ham have never lost two games on the bounce to Watford and this is a record we have to defend today. Overall it is a very positive good record against the Hornets with West Ham having won 22 out of 35 league meetings. At Vicarage Road we have won 9 out of 17, having lost just 4 times. In the last 12 encounters (home and away), however, it is a very even contest with each team having won 5 with 2 drawn games. Sun, sand and warm weather training have not worked their magic on Andy Carroll’s groin by all accounts and he remains a major doubt for today’s game. If there is any doubt at all with Carroll it is likely that he will be missing and not even on the bench. With fellow physio room inmate, Diafra Sakho, still some weeks from recovery I would expect the man-for-all-positions Michail Antonio to turn out once more as the primary striker. I don’t see Andre Ayew as a viable option to perform the role as an outlet or to hold the ball up. If Ayew gets a look in it would probably be at the expense of Sofiane Feghouli but the Algerian did enough in the second half against Albion to earn another chance. Elsewhere, Aaron Cresswell is available and Sam Byram is also fit. My prediction is that Slaven Bilic will avoid a difficult midfield decision by sticking with Cheikhou Kouyate at right back. Expect Darren Randolph to keep hold of the keeper’s jersey despite his recent wobbles. We cannot compare today with that game. It was a long time ago. West Ham had some problems in that period and we were coming from a particular period, too. We did a very good game after losing at the beginning, but West Ham are doing very well now. In a Yin meets Yang moment Watford have a cluster of defender injuries which is handy for them given that West Ham do not have any forwards. Former occasional Hammer’s favourite Mauro Zarate may line up for the Hornets now that he has brought his sulking back to the Premier League. Watford also have M’Baye Niang in their squad the striker having chosen the Hornets over West Ham because they showed him greater love. Today’s potential match spoiler is Craig Pawson from South Yorkshire. Pawson has taken charge of the Hammers on three occasions so far this term; home wins against Bournemouth and Chelsea (EFL Cup) and the 5-1 defeat by Arsenal. In a total of 25 matches Pawson is just one short of his century of Yellow Cards and has 3 red cards to his name. The Lawro challenge shapes up for week 26 with the BBC pundit holding a slender lead. Twenty-five rounds of games in the Premier League have now been completed. That means we have now predicted the results of 250 matches. In Week 25, Rich scored 10 points, Geoff 6 points, and Lawro 12 points. Lawro has narrowly regained his place at the top of the leaderboard, but, as we approach the business end of the season there is all to play for. The EFL Cup Final takes place this weekend so the games involving Manchester United and Southampton have been postponed, leaving just eight matches for us to predict. We now proceed to week 26.